Fifteen years after the departure of the Jets, the city of Winnipeg has arrived at a triumphant moment that many thought would never come. 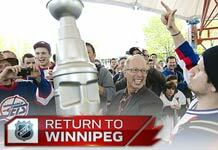 NHL hockey is returning to the Manitoba capital. The True North Sports and Entertainment group announced on Tuesday that they have completed a deal to purchase the Atlanta Thrashers and move them to Winnipeg in time for the 2011-12 season. The sale is still pending NHL Board of Governors approval, which should occur on June 21 when the board meets in New York. The transfer of ownership requires 75 percent approval from the Board while relocation only needs a majority result. Both True North and the Atlanta Spirit ownership group signed off on the deal that had been in the works for several weeks. Legal teams representing the Spirit group, along with teams from True North and the National Hockey League spent Monday night and Tuesday morning completing the final details of the purchase. The franchise price is $170 million, which includes a relocation fee of $60 million. As determined by the NHL Board of Governors, the relocation fee will be distributed among the other 29 teams. The team will play out of the MTS Centre, which opened in 2004 and has a capacity of just over 15,000 seats. With a population of 762,600, Winnipeg will be the smallest market among the 30 NHL cities. The team immediately announced a season-ticket sales campaign in which they will attempt to reach 13,000 subscribers in a drive that begins on Wednesday. A nickname for the team has not yet been selected. Ticket prices for games in Winnipeg will range from $39-$129 per game. "For me, I think the old school jerseys and the name 'Jets' is pretty cool," Thrashers forward Andrew Ladd told the Canadian Press. "It would be fun to be a part of that again." NHL commissioner Gary Bettman spoke at the press conference in Winnipeg where the deal was announced. "Hockey in Canada has never been stronger," said Bettman. "We get to be back in a place we wish had not left in 1996." Bettman was asked by TSN's James Duthie to describe some of the market conditions that were key to helping the NHL return to Winnipeg. "The most important thing for any franchise is ownership, and having Mark Chipman and David Thomson is at the top of the list," explained Bettman. But if you think back to 1996, (the MTS Centre) didn't exist, we didn't have the same collective bargaining agreement that we have now, and I believe the market from an economic standpoint for Winnipeg and Manitoba is stronger than it was." Wayne Gretzky credited revenue sharing, the salary cap, and league television deals as key reasons why hockey became sustainable again in Winnipeg. "I think (those factors) allow a place like Winnipeg to not just have a team but be competitive," Gretzky told ESPN.com. "But I really thought after that (labour) deal in 2005 that places like Winnipeg and Quebec City would be viable again to support an NHL franchise. Because you know in Winnipeg they'll draw 15,000 people a game and that wasn't the case in Atlanta. Winnipeg can count on that." Prime Minister Stephen Harper, a noted fan and hockey historian, issued a statement expressing his excitement about a seventh franchise being placed in Canada. "Memories of the legendary Winnipeg Jets players such as Bobby Hull, Dale Hawerchuk and Teemu Selanne remain fresh in the minds of Canadians," said Harper. "I know that the new team will inspire countless young Canadians to put on their skates and carry on Canada's proud hockey tradition." The Thrashers ownership group issued a statement to supporters in Atlanta while the press conference in Winnipeg was taking place. "It's extremely disappointing to all of us that (this sale) became necessary after all other options were exhausted. We want to express my gratitude to you, the fans, for the years of dedication you have offered to the Atlanta Thrashers." True North, whose principal owners are David Thomson and Mark Chipman, owns the MTS Centre and the building's current occupant, the Manitoba Moose of the American Hockey League. The St. John's Telegram reported last week that a deal is already in place to move the Moose to Mile One Stadium in St. John's for next season. The AHL issued a statement on Tuesday which stopped short of announcing a move of the Moose, but appeared to acknowledge that one is in the works. "While our league will not be the same without the Manitoba Moose, our loss will be the NHL's gain," said David Andrews, President and CEO of the AHL. "Manitoba deserves to have NHL hockey, and we have no doubt that the NHL will be successful in its return to Winnipeg. Our sincere thanks go to the Manitoba Moose fans who have supported the American Hockey League loyally and passionately for the past 10 years." According to TSN Insider Bob McKenzie, the team in Winnipeg will remain in the Southeast Division in the Eastern Conference for one year before the league realigns. When the Jets left Winnipeg for Phoenix after the 1995-96 season, the NHL had four divisions. Winnipeg was in the Central Division with Detroit, Chicago, Toronto, St. Louis, and Dallas. The mood in Winnipeg was jubilant on Tuesday morning as word spread that an announcement of the sale was pending. "A lot of people will talk about the economic impact of having an NHL franchise and I think we can grasp that one very quickly," Winnipeg mayor Sam Katz told TSN Radio on Tuesday. "The one that basically cannot be qualified that, in my opinion is priceless, is how it makes the people of your city feel. "You have to remember about 15 years ago, it was like someone stuck a fist through your rib cage an pulled out your heart. The fan support in this city was phenomenal. The only reason the Jets left here was simply because of the fact we did not have a proper facility and the powers that be at the time could not get their act together to build a new arena." Atlanta mayor Kasim Reed admitted last week that there were no local ownership groups interested in purchasing and keeping the Thrashers in Atlanta. "Anytime we lose a major sports franchise, it's tough," Reed told NBC television affiliate Channel 11 last Tuesday. "It's going to hurt the city, but we'll withstand it and get through it. We have a lot of positive things going on in the sports franchise space that we'll be announcing soon." This is the second time that the city of Atlanta has lost an NHL franchise. The Flames played in Atlanta from 1972 until they moved to Calgary in 1980. The Thrashers began play as an expansion team in 1999. When asked about how some current Thrashers players might feel about playing in Winnipeg, one former prominent player felt it wouldn't be an issue. "They're going to love the fans here," former Winnipeg Jet and current city councilor Thomas Steen told TSN. Thrashers forward Evander Kane sent a tweet expressing his thanks to the city where he began his NHL career. "I want to thank all the Thrashers fans that supported us in Atlanta for my two years there. Very unfortunate there will be no NHL hockey. Thanks again. I will miss the great people and city of Atlanta," said Kane.